Iraqi Prime Minister Haider al-Abadi has announced the start of operations to liberate the town of Mosul from Daesh terrorists. “The time of victory has come and operations to liberate Mosul have started,” he said early on Monday in an address broadcast on Iraqi TV. “Today I declare the start of these victorious operations to free you from the violence and terrorism of Daesh,” he added referring to the residents of Mosul. He added that Iraqi army is leading the operations with support from the national police force, while stressing that “others” will not be entering the city. Abadi has on multiple occasions asserted that all troops participating in the Mosul offensive are from Iraq, and no foreigners would be among them, adding that the US-led coalition would only support the operation. US Secretary of Defense Ash Carter said that the Mosul operations were a key move in defeating the Daesh Takfiri terrorists. Over the last few months, Iraq has been preparing for the assault on Daesh in Mosul, which slipped into the hands of the terrorists in the summer of 2014. Government forces have managed to recapture all the other places that Daesh had seized, with the last major one being the city of Fallujah, which was liberated in late June. Violence has plagued the northern and western parts of Iraq ever since Daesh launched its offensive in June 2014, and seized territory. 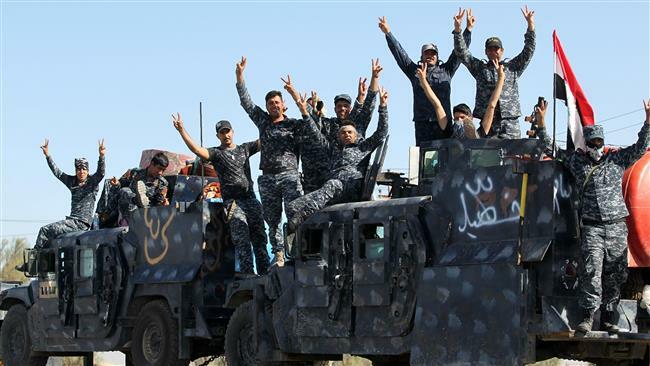 Iraqi army soldiers and fighters from allied Popular Mobilization Units are seeking to win back militant-held regions in joint operations.